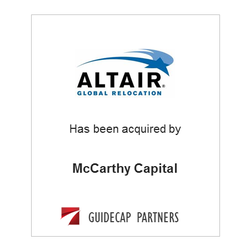 Altair Global Relocation has been acquired by its senior management team and McCarthy Capital, a private investment firm based in Omaha, Nebraska. Altair is an independent, full-service relocation management company offering a comprehensive selection of U.S. and international mobility solutions. Altair’s clients are some of the most recognized names in the global business community. GuideCap Partners initiated the transaction and acted as financial advisor to Altair.